The developer ViRiX has brought a piece of industrial archaeology back to life on the old Stella Artois site in Leuven. 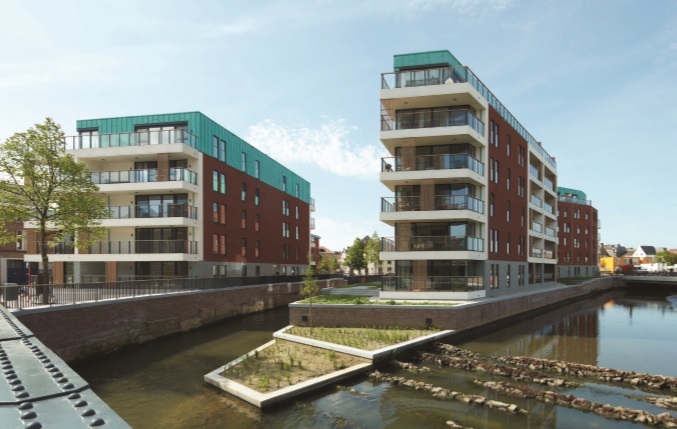 DijleDelta is now a sparkling park, with new living areas and water everywhere. For this project SVR-ARCHITECTS designed two apartment buildings and restored the Smidse market hall. Murmuring water, green paths, renovated wharf walls and a genuine lock inevitably suggest Camden Lock, the now bustling neighbourhood around an old lock on the Regent’s Canal in the heart of London. Thoughtful siting of the buildings, architectural nods to the industrial past, and the quality of the entire project promise ‘the good life’ to future residents. Green, water and quality architecture are the three pillars of the project. Island and Party Hall, the two new buildings comprising a total of 80 apartments, have neither front nor rear façade, but instead feature a consistent all-round façade. Expanses of red-brick cladding alternate with white concrete surfaces and upright wooden screens. Down below the buildings rest on a high granite plinth, while on top they are crowned with copper cladding. This design achieves a compact but far from monotonous façade. Open architecture was chosen for the living areas, with large areas of glass, while the sleeping areas are sheltered by a more closed architecture. All apartments enjoy interior and exterior terraces with views of the Lock Park and the surrounding water. In short, this new world of buildings, gardens, a park, a lock, watercourses, bridges, and wharves transmits the sensation of a self-contained village. A fresh, vibrant, green district which, like London’s Camden Lock, is ready for a new future, here in Leuven.